We may have created lots of blog and some of them are now popular with good traffics, Now we want to merge both blogspot sites to get double traffics from both blogs, at that time we have to take a 302 Redirection. This will be useful when you have added the custom domain with new platform like Wordpress. This will be very useful when you have the broken links and 404 pages. This will be useful when you have many popular blogs with good traffics, now you want to migrate all of those blog. 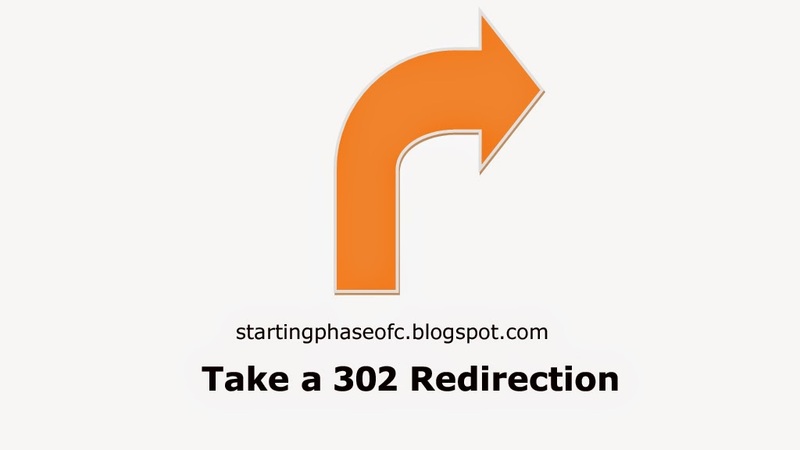 There are 2 kinds of 302 Redirection, Redirection of Specific Pages, Redirection of Whole Blog, and Redirection in a specific time. How to redirect automatically blog or blog's pages to another blog or domain? Go to Blogger Dashboard >> Template >> Edit HTML. Now search ( Ctrl+f) for </head> tag. If you want to redirect whole blog copy the below code just above the </head> tag. change http://startingphaseofc.blogspot.com with your own URL, Then save the template and you are done. If you want to redirect Specific Page copy the below code just above </head> tag. Remember, Change http://yourblog.blogspot.com/pages with your source URL and http://startingphaseofc.blogspot.com with your Destination URL. then save the template and you are done. If you want to redirect your blog to another blog or domain in specific time, copy the below code just above the </head> tag. Now remember http://startingphaseofc.blogspot.com with your Destination URL then save the tempalte and you are done.